U.S. #3178 measures 3 inches across and 1.5 inches tall. 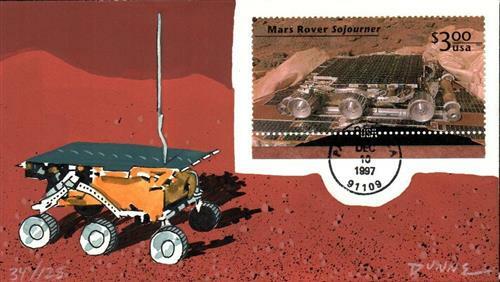 On December 10, 1997, the USPS issued its largest postage stamp, honoring the Mars Pathfinder. NASA launched the Mars Pathfinder on December 4, 1996. The rover landed on Mars on July 4, 1997. Over the next few months, the rover moved across the Martian surface analyzing the planet’s atmosphere, climate, geology, and the composition of its rocks and soil. In all, it sent back 2.3 billion bits of data, 16,500 pictures, and took 8.5 million measurements. Pathfinder sent back its last data transmission on September 27, 1997. U.S. #3178 – Hand-painted First Day Cover. To honor this achievement, the USPS planned a special stamp issue. 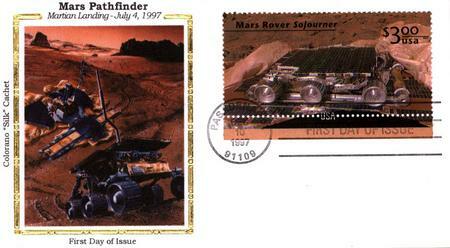 Issued on December 10, 1997, the Mars Pathfinder Priority Mail stamp was the last stamp issued that year. The stamp pictures the first image sent from the Pathfinder, the remote-controlled vehicle, Sojourner, which collected data about the soil and rocks, with the Mars landscape in the background. The Mars Pathfinder’s robotic rover was named for Sojourner Truth, an abolitionist and women’s rights activist. U.S. #3178 – Silk Cachet First Day Cover. 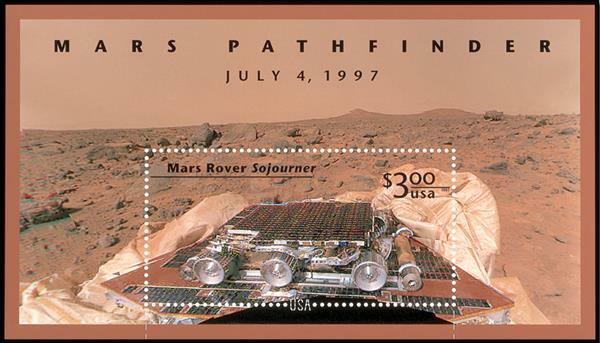 Measuring 3 inches across by 1.5 inches high, the Mars Pathfinder stamp is the largest U.S. postage stamp ever issued. (Newspaper and periodical stamps issued in 1865 were larger.) In addition to being the largest U.S. postage stamp, the Mars Pathfinder stamp has several other interesting features. U.S. #1734 – America’s smallest postage stamp. The Pathfinder stamp has special “USA” perforations on the bottom row of perfs. And the vertical perfs extend beyond the stamp to the bottom of the selvage for easier removal of the stamp. Hidden words were incorporated into the design and are visible with a stamp decoder. They read “USPS” and “MARS PATHFINDER • JULY 4, 1997” in alternating lines. 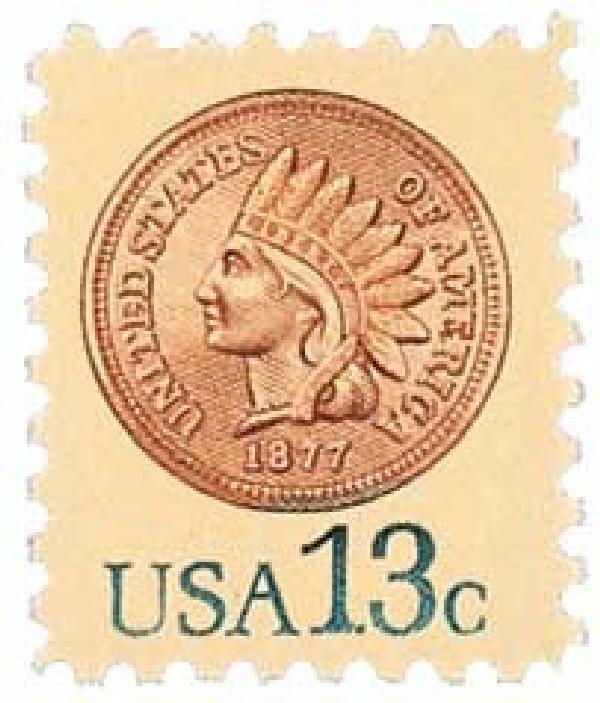 And in case you were curious, the smallest U.S. postage stamp is #1734, the 1978 stamp picturing the Indian Head Penny. It was less than an inch wide! 7 Responses to "This Day in History… December 10, 1997"
My then husband and I were on vacation and stayed up late to watch this on TV. My only problem with the stamp is that it was for Priority postage-had it been for first class rate I would have bought tons of them for my mail! I will probably buy the Mars Land Rover stamp it looks really cool. I have the smallest stamp already placed in my collection. Any Chance in ordering these both gems of History. A great way of starting a conversation about Stamp Collecting. This is a great way of starting a conversation about Stamp Collecting. But most important, is owning a part of Americana. It makes me feel proud to have been around when the both stamps went on the market. Have any good deals on these gems of History?